It’s tough to cover your expenses, much less pay down debt, when you’re a student. When you’re not in class, you’re probably studying or completing your coursework, which leaves little time for earning an income. If you have existing student debt and go back to school, in-school deferment might give you the breathing room you need to continue your education. An in-school deferment allows you to temporarily stop making payments on your student loans while you’re enrolled in school. To qualify, you must be enrolled at least half-time in an eligible institution, which includes most colleges and universities in the United States, as well as some institutions outside of the U.S.
Loan type: Check to see whether your loan includes a deferment option. Federal direct loans, FFEL, and Perkins loans are generally eligible. Parent borrowers and PLUS loans are sometimes eligible, but you should contact your school’s student aid office to verify. Some private student loans also allow deferment, although lenders might use different criteria. Complete forms: To request a deferment, you’ll need to fill out a deferment request form and submit it to your loan servicer. Your loan servicer is the company that you pay or the company that sends loan statements to you, even if you’ve borrowed with federal student loans. Verify enrollment: Your loan servicer will verify that you are enrolled at least half-time. This can happen electronically, but in some cases, you’ll need an official at your school to sign off on your request. If so, visit your student aid office to get verification. Wait for approval: Keep making the payments on your loan until you get confirmation from your loan servicer that your request was approved. If you miss payments before your deferment becomes active, your credit scores will suffer and it might be harder to qualify for other benefits. If your request is approved, you can stay in deferral as long as you continue to meet the requirements, which means enrollment in an approved institution at least half-time. However, you’ll also provide an expected graduation date, which also brings the deferment to an end. If you stay in school longer than expected, you’ll need to do more paperwork. 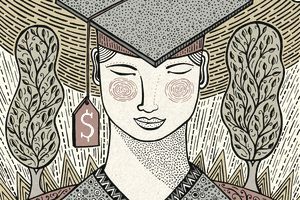 If you have certain subsidized loans, the federal government may pay those charges during deferment. If you have unsubsidized loans, interest will continue to accrue. If your request is denied, you might have other options. Contact your loan servicer immediately if you’re having a hard time making payments. A forbearance provides another option if your required monthly payments are too high for the amount of income you bring in. You can temporarily stop making payments, but interest will accrue on your debt. Income-driven repayment plans allow you to make smaller monthly payments. In some cases, those payments are very low—sometimes $5, or nothing at all, depending on your income. For more details, see the Department of Education's repayment estimator.